Sadly, most people frown on play in the workplace. It’s generally assumed that if you’re having fun then you’re not actually working. This is a shame, because play and work both have an important role to play in the creative process. Unquestionably, seriousness is required in the later stages of the ideation process – when you need to refine and execute ideas, make quick decisions and meet targets. However, when first brainstorming ideas, it is important to accept all suggestions even if they seem wacky and unrealistic. It is often the eccentric ideas that turn out to be the best. Scientists have determined that people in a relaxed state and positive mood are much more likely to develop innovative, inspired ideas. The problem is, it’s not easy letting go of a serious attitude when your surrounding atmosphere is serious. In a profit-driven work environment there’s usually no time for experimenting that may or may not have a rewarding outcome for the business. The focus is often on minimizing risks and maximizing profits – time and again this results in long working hours, stressed employees and a strained environment. The opposite of what’s needed to get the creative juices flowing. Creative workplaces are proven to combat this sort of idea stifling setting and the most innovative companies are taking advantage of this fact. These places of work are designed to help people feel relaxed, energised by their surroundings and able to collaborate with the people that they’re working with. 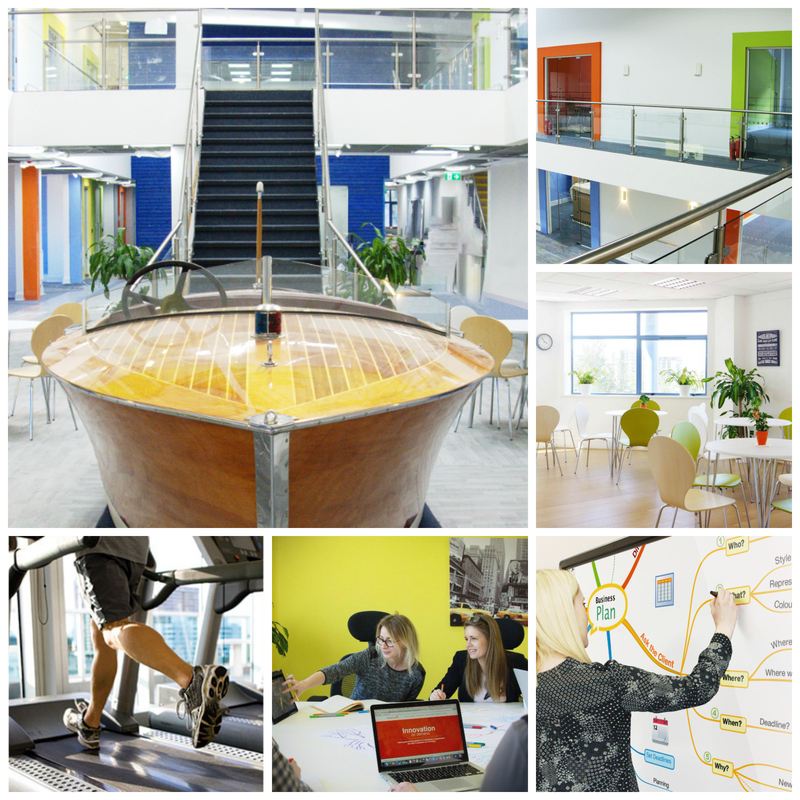 Take Tec Marina for example, it’s easy to be productive, creative and happy at work with rooms designated to playing games, 5* gym facilities to get that work/life balance, co-working desks for bouncing ideas off each other, touchscreens for collaborative brainstorming, and even a 1930s speedboat! The downside to being a little too serious is that it can crush both your desire and ability to be creative. One of the biggest and most debilitating creative blocks of all is the label “I’m not the creative type”. Being creative isn’t limited to artists, designers and mad scientists, so consign this thought to the rubbish bin. The truth is that we are all limitlessly creative – sometimes we just forget our abilities over time and our creative spirit needs awakening. As young children we have boundless imagination – free from limits, practicalities and the fear of judgement. By the time we reach school age the focus is on memorising the knowledge of others, learning that there is one correct answer to questions and one right method to follow. We learn that being wrong is bad, so don’t take risks to avoid making mistakes. This suppresses our ability to come up with our own unique ideas and solutions. By the time we begin our working lives we appear to have lost our creative abilities altogether. But we can be creative again, like we were as small children, by learning how to play. The problem is, playful methods of creative problem solving are generally associated with laziness and time wasting, things that are done when we’re not concentrating. Despite this, the four techniques below can be highly effective when it comes to the creative process. Mindfulness is the art of paying careful attention to the details of the present moment, without judgement. It is a simple and powerful practice that is scientifically proven to release anxiety, stress, unhappiness and exhaustion. Mindfulness can be applied in the midst of everyday mental blocks and challenges, to get you in the right frame of mind for incubating ideas. By removing the strain and constraints of the real world, mindfulness allows you to openly explore possibilities and be more accepting of ideas when they come to you. Through using your senses (what you can see, hear, feel, taste and smell) you can clear your mind so that you are able to look at the problem with more precision. Taking 10 minutes to complete a short mindfulness meditation or exercise will heighten your ability to make connections and develop creative ideas. Purposeful daydreaming is not just a case of setting your problem aside and going off to daydream. Daydreaming can be useful if it is focused and deliberate and you are aware of what you want to achieve from it. First of all, set time aside for your daydreaming and complete some simple preparations before you switch off. Consciously explore every avenue of your problem, get to grips with all of the information that you have available to you and explore all of your options. It is useful to test different perspectives and challenge your assumptions surrounding your problem or goal – remember, the more groundwork you do the more your subconscious will have to ponder. Now you can turn the problem over to your subconscious and go and complete a mind wandering activity such as going for a walk, exercising or driving. Enjoy yourself, relax and allow the subconscious to get to work on new ideas. The most often overlooked resource that can be extremely beneficial to your creativity is good old-fashioned laughter. Numerous studies show that laughter reduces the level of stress hormones in the body that can block creativity and reduce productivity. When in a jovial mental state, you’re more likely to break the rules and challenge norms and assumptions – meaning you will come up with more creative ideas. Doodling is linked to short attention spans and unproductivity, but in reality, it’s an effective way to stay engaged while processing information. It also has a profound effect on creative problem solving and information processing. Doodling is more than mindless scribbling, it’s a fun, easy and expressive way to take a problem out of your head and bring it on to paper where you can deal with it more readily. Start by focusing on what you want to solve or develop, clear your mind of distracting thoughts and channel your inner creativity through drawing any ideas and feelings that come to mind. Focus on the thoughts, facts and solutions that your mind creates and see where your imagination takes you. Or try doodling a Mind Map – this is the perfect tool for creative manifestation. Start by creating a central idea and then radiate ideas from your central theme. At the end, you’ll have a structured doodle of your options and thoughts with the ability to make connections between your ideas. Every workplace should embrace playfulness because it’s through having fun that we forget the limiting concerns and stresses that constrain us. Being stressed and under pressure crushes creativity by distracting us from new possibilities. Practicality should take the back seat at the beginning of the creative process, it’s all about experimenting with different concepts to generate creative ideas. We are then able to unleash the full potential of our imagination to freely explore new creative ideas and methods. In today’s ever changing world, the businesses with strong innovation skills are the only ones that will survive. Those that master the art of innovation will reap the rewards in the form of increased revenue, business success and longevity. Why don’t you try experimenting with a more playful approach to work and re-discover your creative spark? You could realize your most creative idea yet!